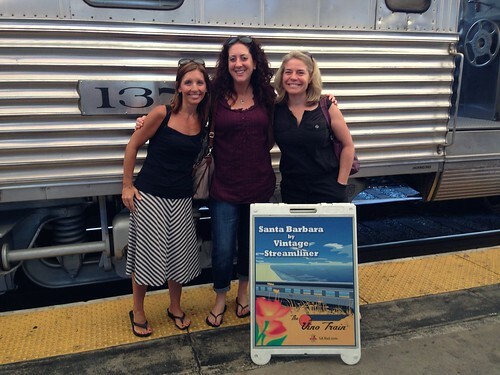 Over Labor Day weekend, two high school friends and I boarded the Vino Train to Santa Barbara to celebrate each of entering a new decade (eeks!) this year. 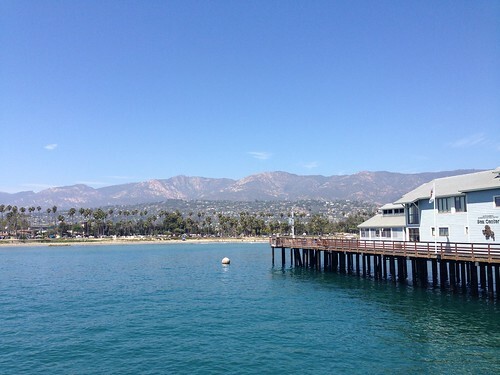 I hadn’t been to Santa Barbara since college, and was excited for our daycation in such a beautiful town. The Vino Train, while attached to the Amtrak Surfliner, is no regular train car–we rode in a 1949 Pullman car complete with a bar and barber shop, and the experience was like none other. The Vino Train is a family business–Conductor Bill owns the train cars, and he employs family and friends on the train. Everyone was incredibly nice and made the ride a lot of fun, and they definitely welcomed us into their family! All aboard the Vino Train! We arrived at Los Angeles Union Station at 7:30 a.m. and made new friends while receiving our lanyards and waiting to board. 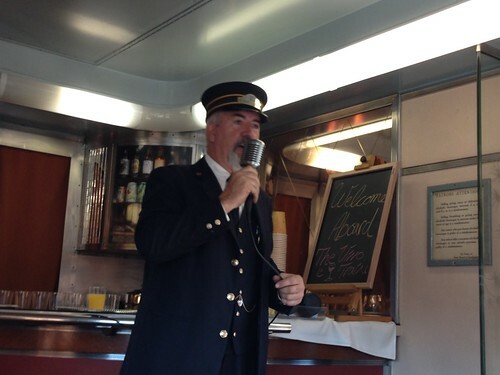 Once seated, Conductor Bill welcomed everyone and we were immediately served mimosas and a fresh breakfast consisting of homemade waffles, fritata, chicken sausage, fruit, and more. 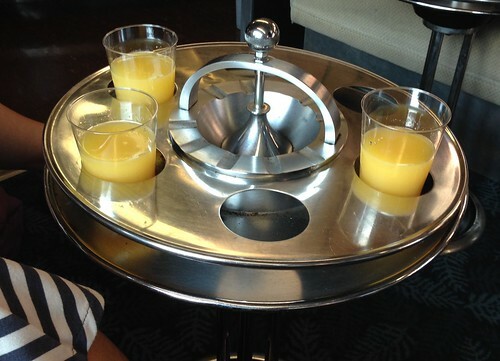 The train even has cool tables that cups fit into so you don’t spill your drink. The day of our ride, the volunteer wine guide wasn’t working, so we were on our own when it came to finding tasting rooms. We immediately took to Yelp (and of course noted the free pours with check-in), and planned our first tasting room visit. Ben at Corks n Crowns. Ben was kind enough to suggest we head to Drake and Chatter next, and Brett, although camera shy and working his last day at that location, was awesome as well. 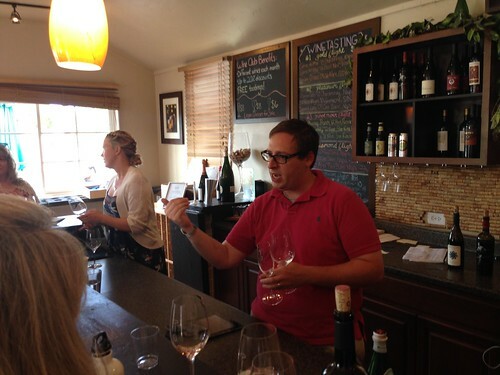 Drake had a specific tasting flight as they are known for their pinot noir, so we all tasted the same wines. After an hour tasting and chatting with Brett, we were all a bit toasted and beyond ready for lunch. 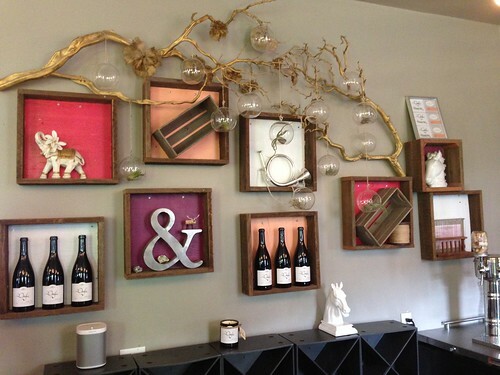 Fun decor at Drake and Chatter. The group, definitely ready for lunch! 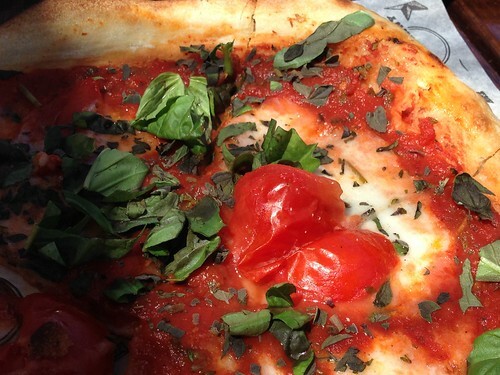 We split from our new friends and headed to Lucky Penny (suggested by both Ben and Brett) for lunch, and had amazing pizzas and sandwiches out on the patio. When we arrived in Santa Barbara, the coastal fog hadn’t yet worn off, so it was pretty cool, but by lunchtime the weather was beautiful. 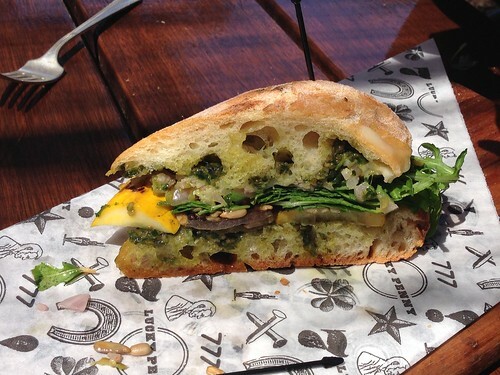 Get the pesto sandwich with extra pesto. After getting some much needed food in our bellies, we headed to Deep Sea Tasting Room out on the pier, and met up with our new friends again. At this point we thought we had smartened up, and ordered two flights for the three of us, but somehow still ended up with 12 glasses. Unfortunately, we didn’t learn anything at this tasting room since it was incredibly crowded and we were sitting outside on the pier rather than inside at the counter. Side note: Get in as many tastings before noon because after that, the rooms get super crowded. Not a bad view from our third tasting room. Since it was in the 80s and we had been sitting in the sun, we decided ice cream was in order! We made a quick stop at the ice cream shop just downstairs from the tasting, and walked to our final tasting at Kunin. At Kunin, our final tasting. 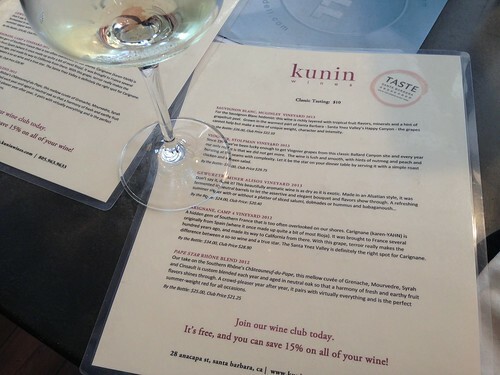 Kunin was also incredibly crowded, so we enjoyed our tasting at the communal table. By this point, I was pretty much done so I just took a sip of each of the wines in our (I think two) flights. We didn’t have much time left; it’s pretty amazing how quickly five hours of tasting wine just flies by! We walked back to the train station to meet up with the rest of the Vino Train riders, and took some pictures before boarding. Once seated, we were offered dinner and yes, MORE WINE. This may be the first time in my adult life I actually passed on wine and opted for soda instead. Yep, even more wine on the train! A couple hours later, we returned to Union Station, hopped on the subway, and were back in Hollywood before we knew it. 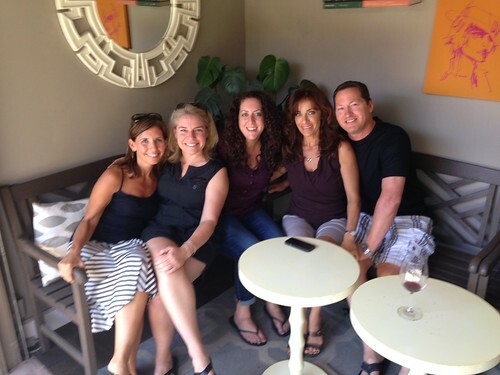 We decided this was our new annual girls’ trip, so we’ll be on board the Vino Train again Labor Day weekend. See you next year Conductor Bill! This was such a fun day! I definitely recommend the Vino Train to anyone looking for a relaxing way to spend the day. It was wonderful not to have to worry about driving after a day of tastings. The atmosphere on the train was delightful. I’m already looking forward to next year! 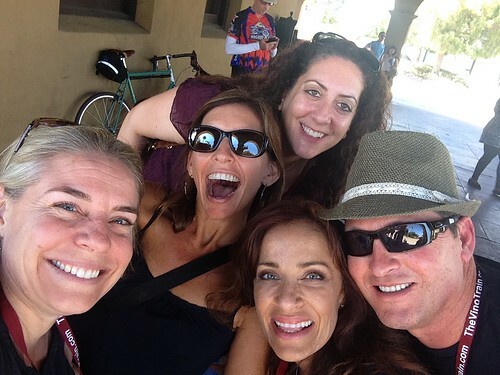 It was a delight having you ladies on board and so glad you had a nice time … see you next year! !